The publisher told Eurogamer this afternoon that "Ghost Recon: Future Soldier has not been announced on PC", and that "Ghost Recon Online is the PC equivalent". However, Future Soldier was announced for PC in 2010, albeit partially - specific details were to follow (but never did). An official forum for Ghost Recon: Future Soldier on PC supplies further evidence that a multi-platform release was once Ubisoft's intention. Ghost Recon Online senior producer Sebastien Arnoult, to PC Gamer, explained: "When we started Ghost Recon Online we were thinking about Ghost Recon: Future Solider; having something ported in the classical way without any deep development, because we know that 95 per cent of our consumers will pirate the game. "So we said okay, we have to change our mind. "We have to adapt, we have to embrace this instead of pushing it away. 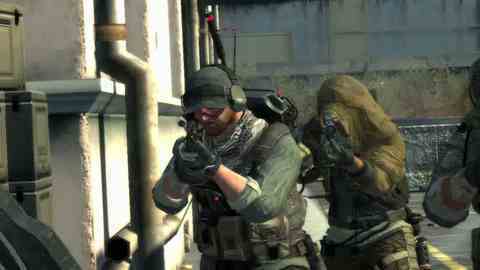 That's the main reflection behind Ghost Recon Online and the choice we've made to go in this direction." "To the users that are traditionally playing the game by getting it through Pirate Bay, we said, 'Okay, go ahead guys. This is what you're asking for. We've listened to you." He added: "We are giving away most of the content for free because there's no barrier to entry. To the users that are traditionally playing the game by getting it through Pirate Bay, we said, 'Okay, go ahead guys. This is what you're asking for. We've listened to you - we're giving you this experience. It's easy to download, there's no DRM that will pollute your experience.'" Ubisoft Singapore is making Ghost Recon Online. The PC game doesn't look dissimilar to Future Soldier on PS3 and 360 but won't, by the looks of things, feature a single-player campaign. "I don't like to compare PC and Xbox boxed products because they have a model on that platform that is clearly meant to be €60's worth of super-Hollywood content," said Arnoult. "On PC, we're adapting our model to the demand." Ghost Recon Online is in closed beta in Germany and France. The closed UK beta test is schedule for the next few months, reported PC Gamer. You can apply for the Ghost Recon Online beta on the game's website. Ubisoft is a publisher synonymous with problems regarding piracy on PC. The publisher tried to combat piracy with DRM, but ended up alienating legitimate PC game buyers in the process. Those legitimate buyers tussling with restrictive DRM had to wait weeks after console release for their port, too. The result was angry backlash for Ubisoft. And things seem to have come to a head with downloadable XBLA and PSN game I Am Alive, which isn't being offered on PC at all. Can we presume that Ubisoft has had enough? "Perhaps it will only take 12 guys three months to port the game to PC, it's not a massive cost but it's still a cost. If only 50,000 people buy the game then it's not worth it," I Am Alive creative director Stanislas Mettra explained this week. Tom Clancy's Incredible Gun Collection.